Out on town, a photo by Kalexanderson on Flickr. Happy Father's Day to all you dads out there. And of course extra special Father's Day hugs and kisses go out to my wonderful husband because not only is he a super awesome person to be married to, he's also the best dad in the whole wide world. I hope my children will always appreciate how lucky they are to have a daddy like him. I love this father and son picture. 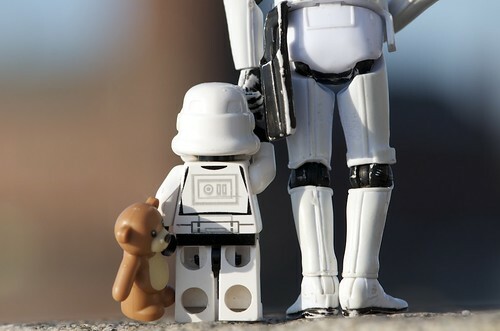 OK so I've never actually seen any of the orginal Star Wars films or know anything about Stormtroopers but I do know that this is really cute. It's a brilliant idea that's really well executed. And I really love the extra detail of the little teddy bear as it makes the picture even more sweet. 'wet silhouettes' by .•˙ TIM ˙•.